The Spirit of St. Louis is engulfed by well-wishers upon its arrival in Paris. The $25,000 prize was beside the point, especially when ice on a wing or sleep could be fatal. 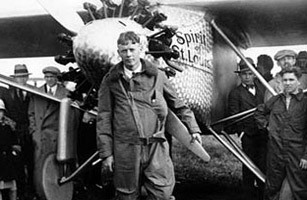 Charles Lindbergh had flown the Spirit of St. Louis from California to New York, so he was used to the air-cooled Whirlwind engine, a splendid name for something attached to little more than a flying gasoline can. But the Atlantic was ocean, with no chance of a soft landing for 4,000 miles. He crossed it in 33 1/2 hours, the first to do it solo and nonstop. You'd think he'd brag. But Anne Morrow, who married him, recalled being captivated by his shyness. It burnished her image of his landing at Le Bourget airfield, "the picture of that mad crowd, that whole nation surging around his plane in Paris," she wrote. "I can see how they all worship him. ... His glance (was) keener, clearer and brighter than anyone else's, lit with a more intense fire." He was, she said, one of the "great bulldozers" of the century.